Hagerstown Canteen Service in Middletown is a full line vending company that offers vending service, office coffee service and water filtration. Partnering with us will get you an instant, no cost upgrade to your Middletown business. Your employees will have access to food and drink right in your building. We have hundreds of options available for your business, many of which weren’t possible even ten years ago. Our services allow your Middletown employees and customers to have frozen products, full meals, dinner entrees and much more. 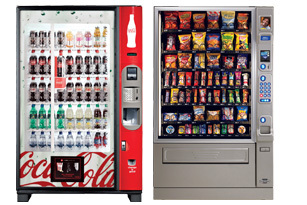 Our machines are installed by Hagerstown Canteen Service at no charge. We handle all of the work. Every machine will be filled, serviced, cleaned for you by one of our professional drivers. And we guarantee you'll only get the newest, most up to date machines with the latest and greatest technology. If you have a large volume of staff or customers, your Middletown business might also qualify to have a Micro Market installed with a self checkout kiosk. The market and our vending machines are tailored to fit your specific needs so your employees have what they want and are quickly back to work doing the things you need them to do to stay competitive. We keep your break room fully stocked with cups, napkins, paper towels, utensils, Kleenex, sweeteners, sugar and creamers galore all ready to use at all hours. This will eliminate the long delays in productivity when employees leave to head to the local Middletown coffee shop. We also add water filtration to your existing water source for hot and cold filtered water on demand. It's easy to get started. Contact us at (301) 223-8000 or info@hagerstowncanteen.com.